May 27, 2015. I’m feeling a bit homesick today. Memorial Day was two days ago, and usually the whole family converges in Kentucky for a barbecue, so I’m a bit sad to be missing everyone. The good news is, my littlest sister is coming to visit at the end of the week, and I’m super grateful about that. I’m hoping the weather clears up, because Norway is having it’s coldest, wettest May in 40 years. Definitely a downer. Huddling beneath a heat lamp, swathed in a blanket, seated on a lambskin, I think the weather might become downright bearable. To combat the blues, Matthew and I held a Memorial Day cookout for some of the folks from work. We grilled burgers and sweet potato fries in the oven, and I made a Greek salad as taught to me by my friend Kiki, plus Martha Stewart’s recipe for Mango Upside-down Cake. Of course, because of the rain, we had to eat indoors. 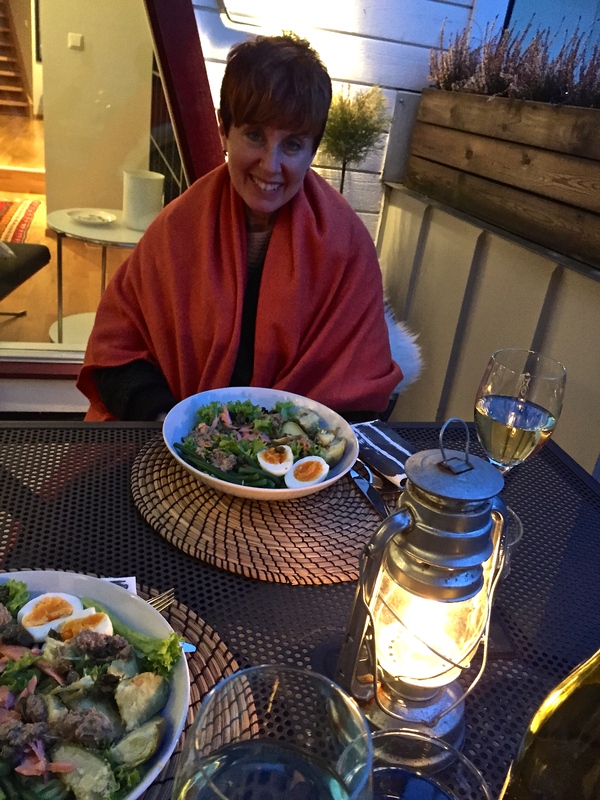 But last night we had a brief dry spell, so Matthew and I dragged the lambskin pelts onto the balcony, fired up the heat lamp, and had a nice dinner of salad Niçoise with a glass of rosé. Nothing flies the flag of rebellion in the face of poor weather and shouts, “Yay, it’s summer!” like Niçoise with rosé. And so, I continue to try and find the silver lining to the clouds that seem to cover the skies persistently here. One thing I can say, Norway has absolutely the most dramatic, beautiful skies I’ve ever seen, hands down. Though clouds are usually omnipresent, they’re certainly not static, providing more than their fair share of entertainment value as they billow and race across the horizon in an ever-shifting panorama. The finger of God — looks like he’s pissed. Sometimes I swear I’m looking at a scenic backdrop as it’s being rapidly yet silently unfurled across a stage set. 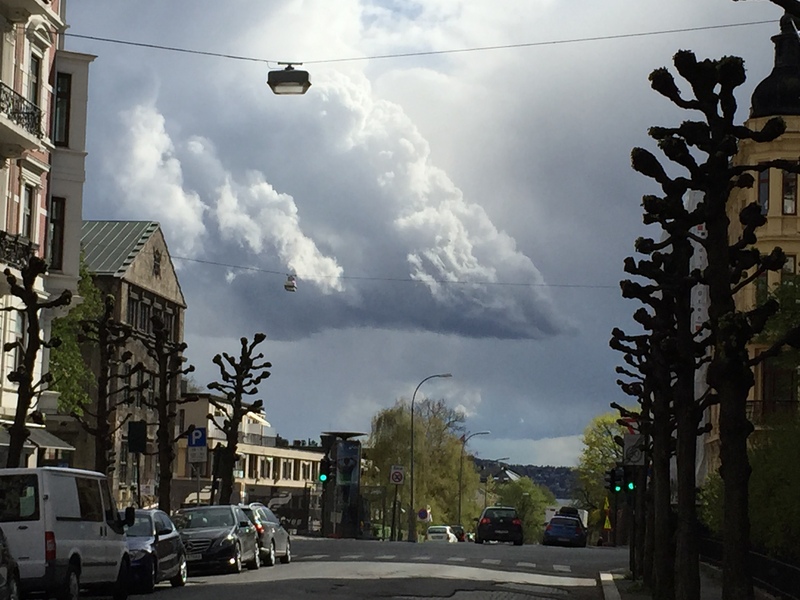 It’s weird because since we’ve moved here I have yet to see lightning, and I’ve heard only one clap of thunder, and yet the heavens frequently look like God’s wrath itself is descending upon Oslo. Every now and then, blue will make a brief bow, the sun will peek through for a cheeky wave … and then it’s back to our regular programming of quiet yet torrential rain. Fair weather for sailors…for the moment. Stage set from our kitchen window. Winter was a lonely sky, with only giant pigeons, sparrows, crows, and seagulls to keep it company. These rhodes have been going for weeks with no signs of slowing dow. Doggedly pursuing my “looking on the bright side” theme, I’ve noted that the cold weather here also has amazingly preservative qualities when it comes to spring flowers. After years of living in Chicago, I’m used to a three-day window of appreciation for daffodils, bluebells, snowdrops, and other fragile seasonal beauties. Then a blast of wilting, 90-degree heat will hit, and it’s bye-bye blossoms. But here, the consistently cool temperatures have extended the blooming season for weeks and weeks. The rhododendrons and azaleas have been going strong for almost two months, and the lilacs have been around for at least five weeks. The roses? What can I say, other than that they’re the most stunning examples of their kind I’ve ever witnessed. They look like multi-layered crinolines of square-dancers, impossibly huge and frilled, just begging for a turn around the dance floor that is my living room. Somehow I’ve managed to refrain from plucking dance partners from my neighbor’s yards and have stuck to simply admiring the promenade from afar. White lilacs in bloom — the smell is spring itself. Even the poor, clubbed, plane trees are starting to sprout leaves from their amputated knuckles. I’m shocked that roses do so well in such a cold climate. This patch of tiny English Daisies (Bellis perennis) has lasted forever. Gorgeous Bridal Bush (Spiraea vanhouttei). Spotted Loosestrife (Lysmachia punctata), which I’ve never seen in the U.S.
I’m often surprised that ornate and highly planned landscaping doesn’t seem to be a priority here. Most folks practice more “specimen” planting, plopping down bushes and flowers willy nilly, rather than working to create any sort of a visual tableau. I suppose it might be because the natural Norwegian landscape is so gorgeous, no one feels they can compete with their own meager manmade prospects. 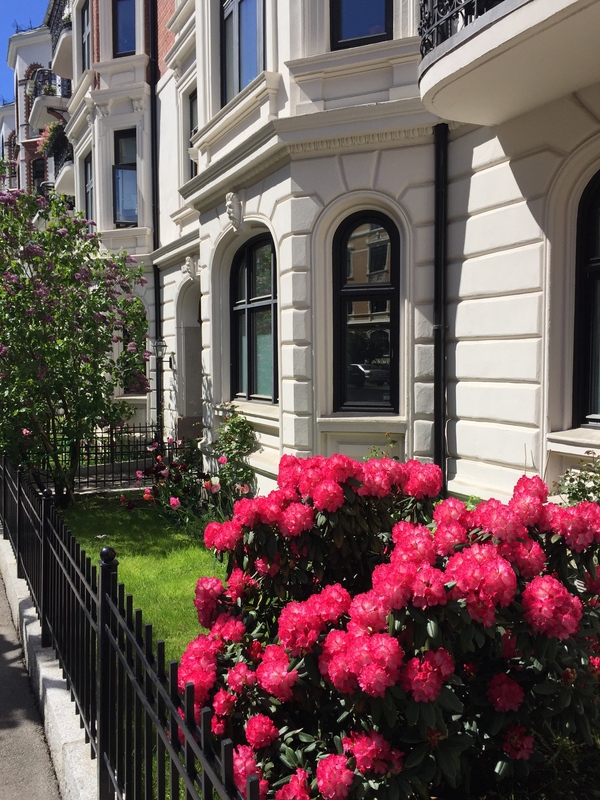 But be that as it may, the flowers are still hardy, healthy, beautiful, and larger than life, just like the Norwegians themselves. This patch of wild lupines was growing right by the side of the road. I’m standing up, so this giant lupine is almost five feet tall. A closeup shows how gorgeous these guys are. And speaking of size, birds here also attain enormous proportions. Over the winter, I put a bird feeder on the balcony to provide a bit of “kitty TV” for our feline friends. The only takers were colossal Eurasian Hooded Crows (Corvus corone cornix) and seagulls as big as eagles. Rather than entertaining my cats, these feathered behemoths unintentionally terrorized them with their mere gargantuan bulk. Both Nick and Jess hid around the corner, peeping out fitfully to see when Godzilla might arrive on the scene and begin the epic battle. 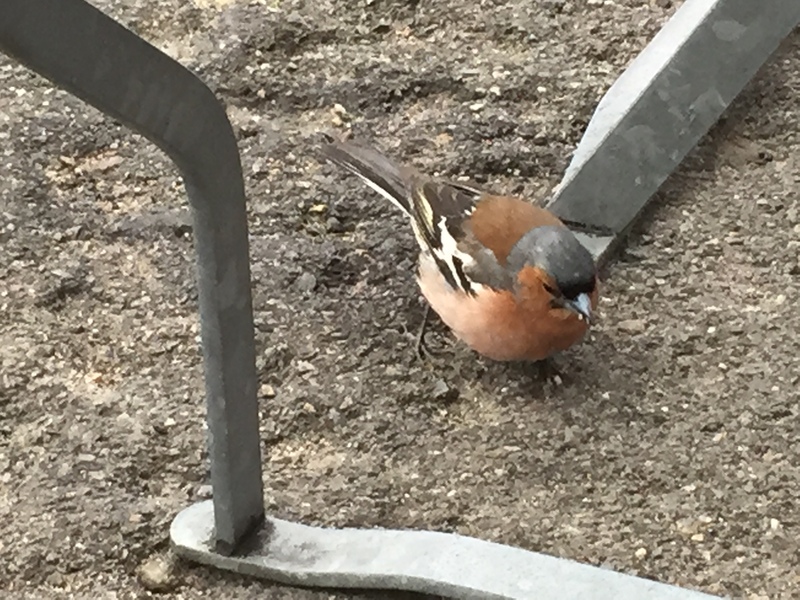 A Chaffinch (Fringilla coelebs) has returned for the season. Now that spring is here, more normal-sized migrants are beginning to show up, which makes both me and my furballs much happier. So if southern bird species are headed back our way, can true summer be far behind? 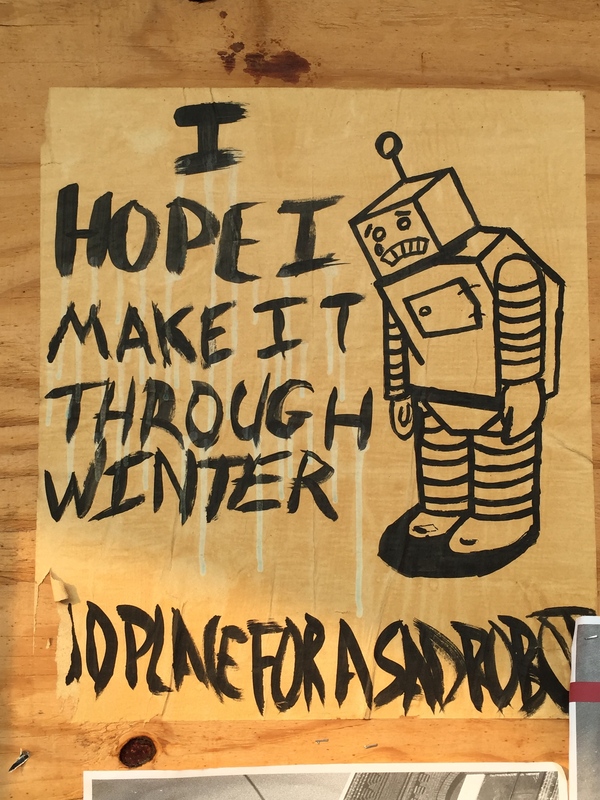 Let’s hope not — cross your fingers and stay tuned!